You are what you eat, or. . . you are what your customers eat. Food is so important to us as people that its advertising power is infinite. 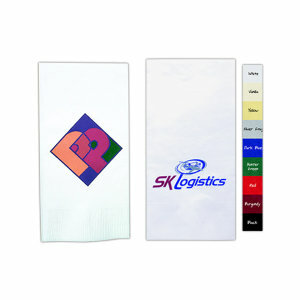 Custom logo or personalized food gifts from IASpromotes.com are a great way to get people excited about your company. 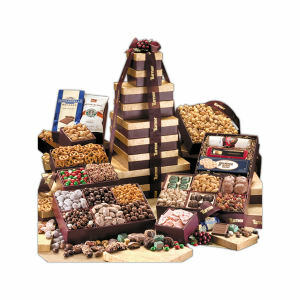 Everybody loves and shares food, especially promotional items like custom mints, chocolate, and food baskets. Add your logo, artwork or tagline and your advertisement will go down as easily as that customized spring water with your name on it. So when IASpromotes.com says you are what your customers eat, of course, we don't mean literally. But it is proven that people associate the comforting, strengthening, and life giving feelings that food gives us with those who provided us the food. That is why customized promotional food gifts and merchandise are the single best way to encourage your customers to think of you as a supportive force in their lives. They will equate the warmth of chocolate melting in their mouths with the warmth of your customer service. 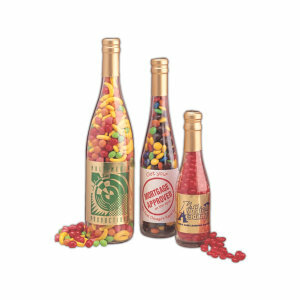 All of our food, candy, and beverage personalized promo items are engraved or printed with your logo, artwork or tagline, so as your clients are consuming your food gift, they will be thinking of you. 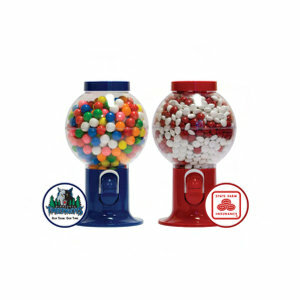 IASpromotes.com carries thousands of candy options so that your promotional candy items are sure to satisfy any sweet tooth. Whether it is printed chocolate, jellybeans, mints, or gum, you're sure to find the sweet treat that will impress you customers and build your corporate brand. 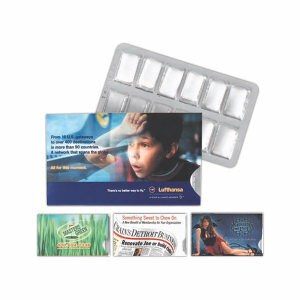 All of our promotional product candy options come in a variety of packages, ranging from unique shapes and designs to standard wrappers, tins, or plastic containers. Chocolate even comes molded into a variety of shapes so your custom promo chocolate morsel can reflect your company's logo or image. 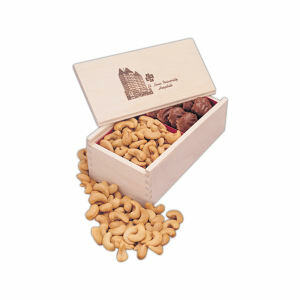 Always say "Thanks" or "We enjoy doing business with you" with a delicious bit of personalized promotional candy. Nothing means quite as much to us as people as the beverages we drink. Water refreshes us and coffee or tea gives us a boost. Personalized branded beverage products are a wonderful way to advertise your company, because your gift is sure to help your clients, students, or employees feel just a bit better through the long work day. 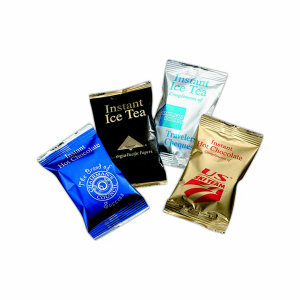 IASpromotes.com carries a large selection of coffee, tea, and hot cocoa mixes so you can pick the manufacturer that makes your customers drink exactly how they like it. And when clients are carrying your branded bottled water around the tradeshow or corporate event, everyone is sure to know which table is handing out the refreshing beverages, because you logo will be enshrouding the bottle. Personalized business bottled water really tells your clients and employees that you care about them. Can't decide which specialty branded food or beverage merchandise you want to send out to your clients? Choosing just one business promotional item doesn't feel quite special enough? Sometimes you just need more. If you want more marketing items, IASpromotes.com gives you more. Take a look through the customized corporate gift baskets. These logoed gift baskets are unique and are a wonderful way to show a group of customers that you really appreciate them. With so many sizes, shapes, and assortments of food advertising arrangements, you're sure to find the personalized gift basket that delivers the right message. Also, be sure to browse through the selection of promotional ad popcorn tubs. These promo popcorn tubs are another way to tell a number of people that you were thinking of them. And let's be truthful for a second - everyone loves popcorn! Especially caramel corn, am I right? And popcorn tubs are so big that your logo will look like a screen-printed billboard sitting in the conference room! No matter what you are hoping to say with your food, candy, or beverage promotional gift or giveaway, IASpromotes.com carries the selection that will meet your needs. And no, your eyes are not deceiving you; IASpromotes.com really does carry custom branded promotional meats! Nothing has quite as much specialty advertising power as a ham or turkey sitting on an imprinted cutting board. Just call or email on of our advertising specialist for a quote or if you have any questions. We're always here to help!